An assembly can consist of multiple parts made from different materials. To correctly compute the mass, center of gravity (centroid), and inertia of such assemblies, BricsCAD supports individual densities for components. A physical material for a mechanical component is defined in the Material property in the Mechanical Browser. By default, a component inherits the density of the assembly, in which it was inserted into or formed from. 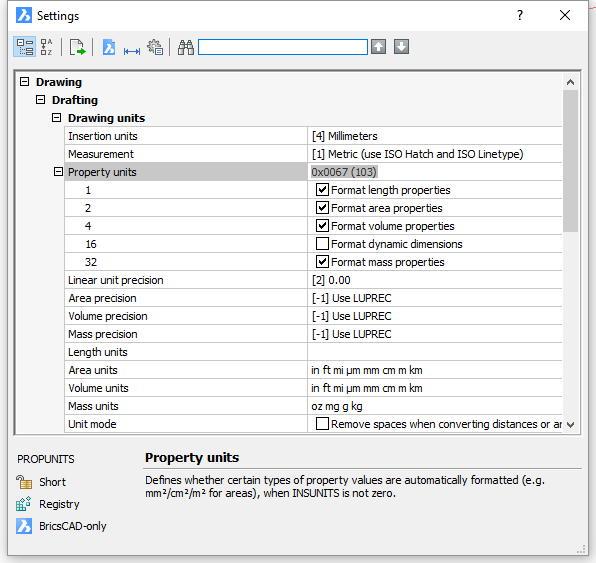 Expand the Property units settings under Drawing / Drafting / Drawing units. 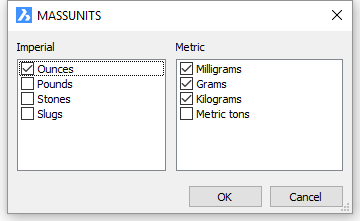 Check the Format mass properties checkbox to enable formatting of mass values with appropriate units. Select the Mass units field, then click the Browse button ( ) and specify the desired mass units in the MASSUNITS dialog box. Specify the desired precision in the Mass precision field. The Mass units setting affects the mass values only. Other mass properties such as density or moments of inertia will be formatted in SI units for the metric system and in imperial units for the imperial system, regardless of the value of the Mass units setting. You can compute mass properties for the entire model or for a selection of 3D solids and/or subcomponents. The values of mass, volume, centroid, moments of inertia, products of inertia, radii of gyration, principal moments and X-Y-Z directions about centroid are reported in the command bar. Optionally you can align the User Coordinate System with the inertia axes, as a result, the center of masscentroid of the component lies at the origin of UCS, which can be useful to investigate the behavior of a product under gravity force.